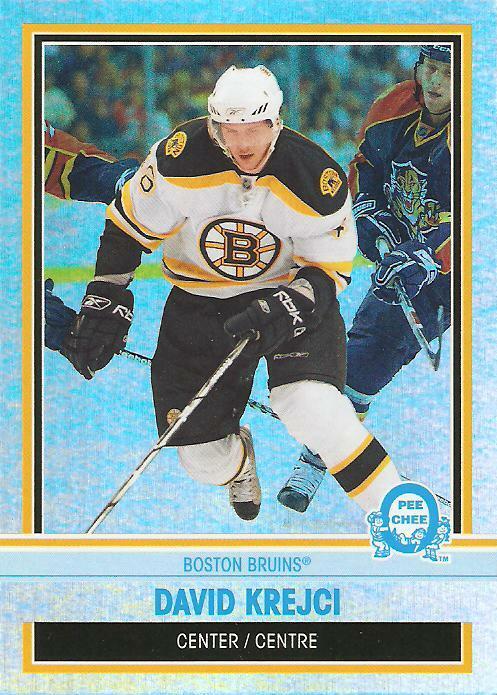 First up is the 2008-09 O-Pee-Chee gold parallel. You can see the base card here. 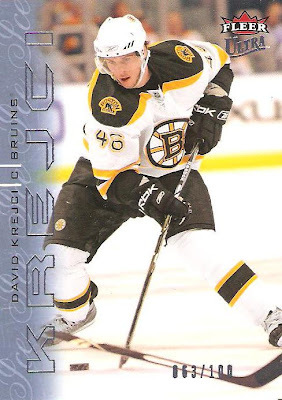 It doesn't show well in the scan, but the gold parallel consists of a slightly sturdier, foil type card stock that gives them a "gold" tinge. 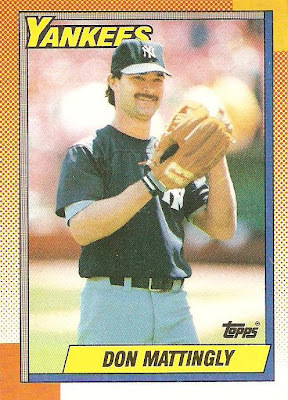 I bought two hobby boxes of this stuff last season and I want to say these were seeded at maybe 6 per box or so. Just the sort of thing I hate as a set collector. 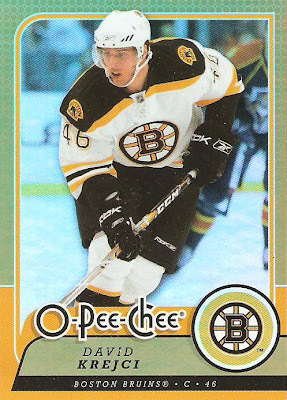 Next we have a parallel of a parallel, a 2009-10 O-Pee-Chee Retro Rainbow card. 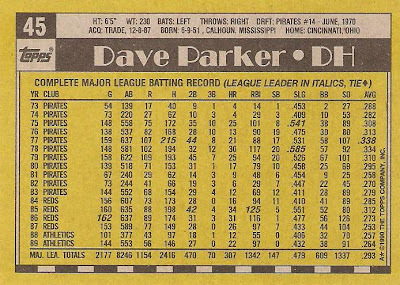 This is a parallel of the regular Retro parallel, which you can see here. 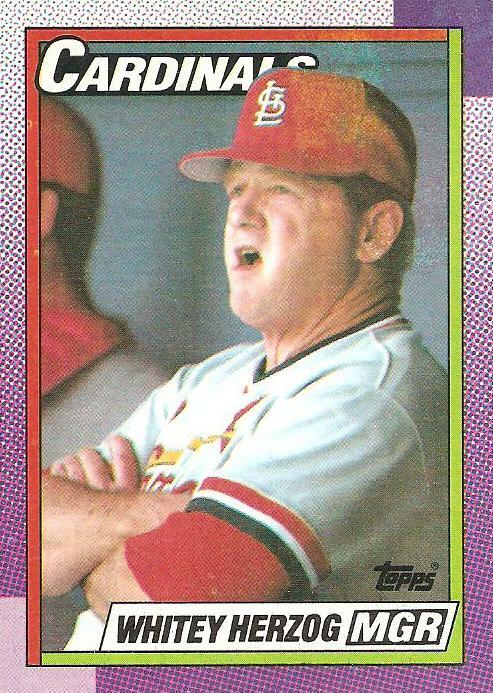 The Retro Rainbow cards are on glossy card stock with a rainbow foil, and are numbered to 100. Finally, we have a 2009-10 Fleer Ultra Ice Medallion parallel. 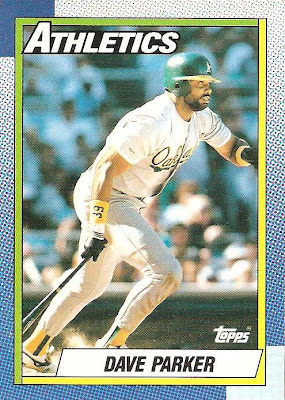 These mirror the base set with the exception of the "ice colored" left border. They are numbered to 100 as well. 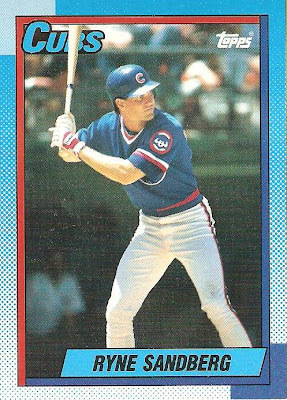 #210 - Ryne Sandberg - On the opposite end of the spectrum, Sandberg had an awesome 1990 season. He set career highs in home runs (40), RBI (100), and runs (116). Oh yeah, he also captured a Gold Glove and hit .306. #214 - Terry Francona - I believe this is the final Topps player card for the current Red Sox manager. 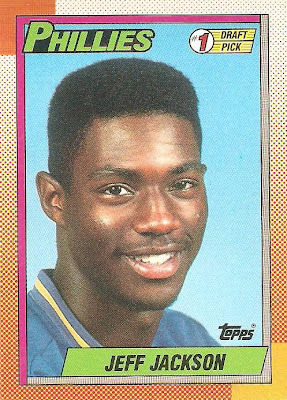 He would see action in just 3 games in 1990, his final season. #220 - Barry Bonds - The first of two players I find completely obnoxious. #224 - Delino DeShields - This particular card was always a favorite of mine. #230 - Keith Hernandez - Kieth would play in just 43 games in 1990 before retiring. 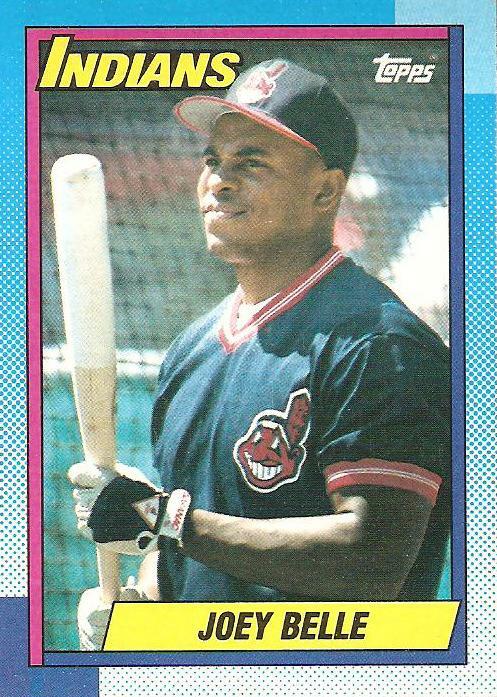 It was not for the Mets though, but rather the Indians. 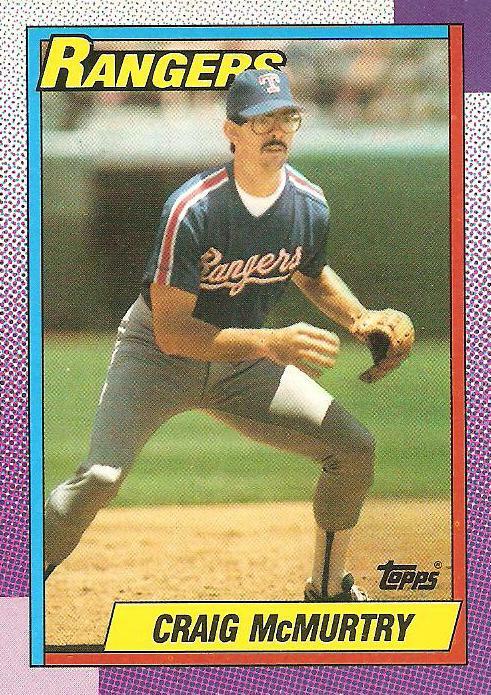 #240 - Mark Grace - I think the positioning of this photo is perfect. #245 - Roger Clemens - The second player that I find obnoxious. 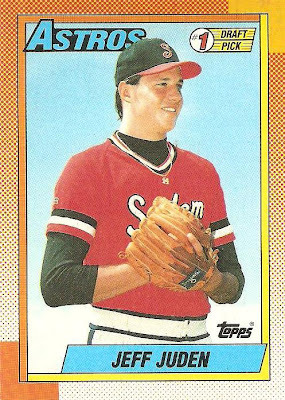 #261 - Whitey Herzog - I always liked the manager cards. 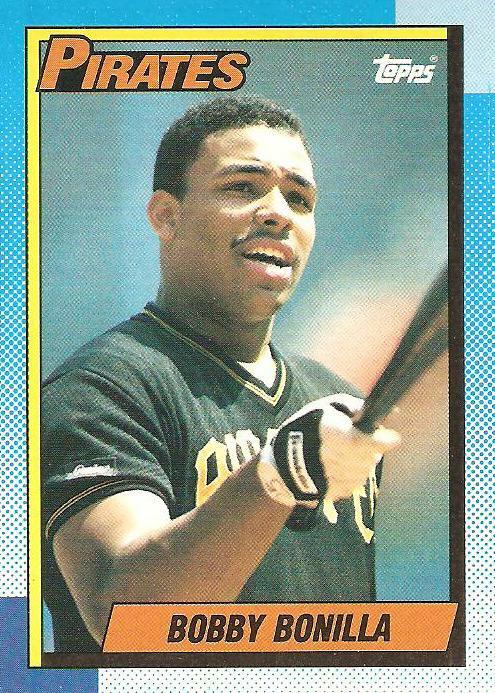 #273 - Bobby Bonilla - Bobby looks pretty threatening here. 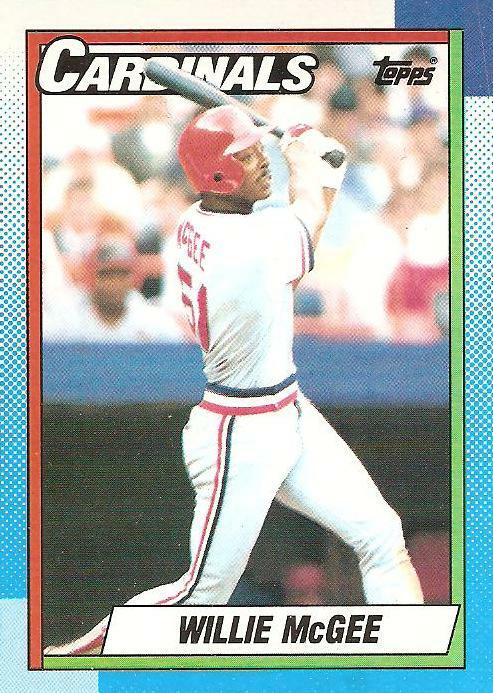 #283 - Albert "Joey" Belle - When I was younger, I was never sure whether Albert and Joey were one and the same. 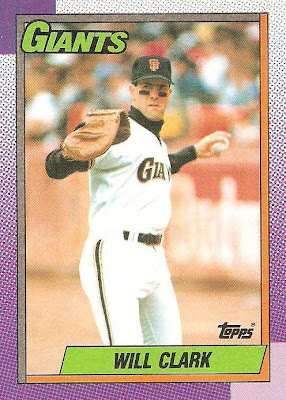 #284 - Mark Gardner - Future Star - Mark stuck around in the majors for a few years, and has been a bullpen coach for the Giants for quite some time apparently. #285 - Willie McGee - This is one of Willie's least funny cards. 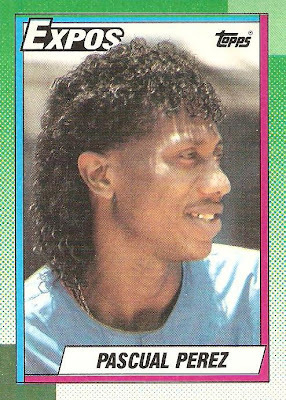 He had some great ones in the 80s. 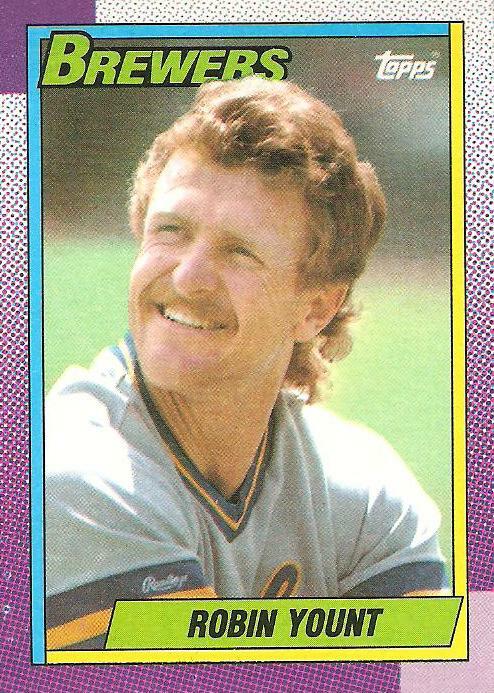 #290 - Robin Yount - A smiling, helmetless Yount. 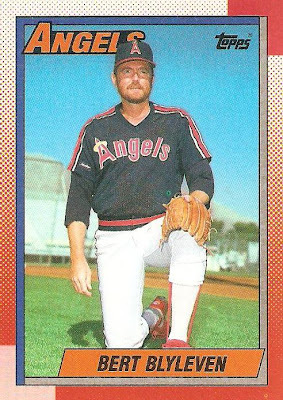 I'm not a huge fan of hatless players on cards. #294 - Craig McMurtry - I picked this one because Craig might honestly be the goofiest looking guy in this set. 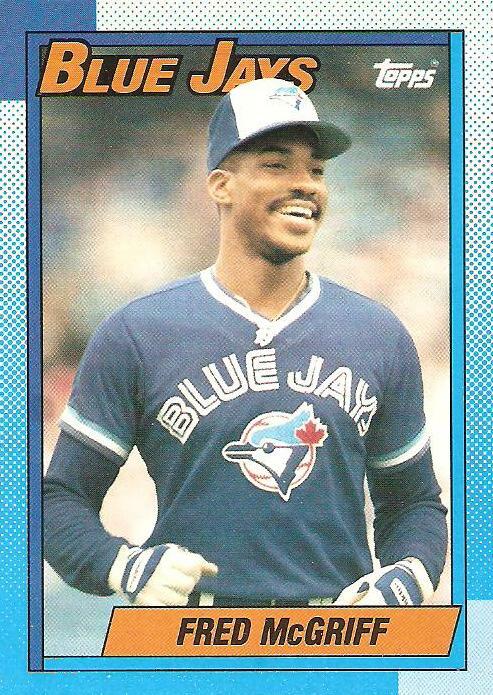 #295 - Fred McGriff - The Crime Dog, looking pretty happy. #296 - Jeff Ballard - We end with Jeff Ballard. 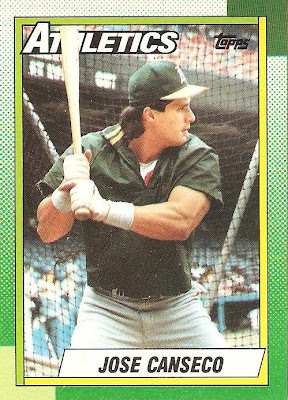 I think it's safe to assume this is one player who was not on steroids in 1990. Well, there you go. This is getting to be quite the project, but I'm going to keep pressing onwards. 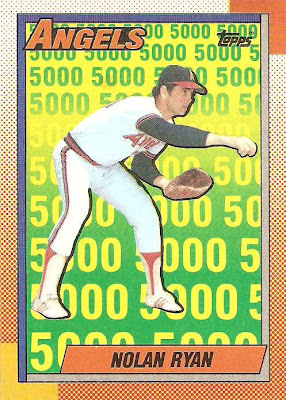 I hope to have cards 300 - 399 sorted and scanned by the end of the week! 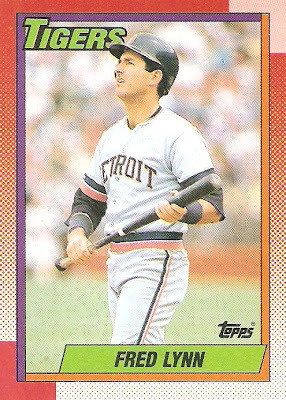 #107 - Fred Lynn - Detroit Tigers - If this were an O-Pee-Chee card it would read "now with Padres", as Fred signed with them as a free agent for the 1990 season. It would be his last. #112 - Glenn Wilson - I know this is an odd choice but I think this card is great. 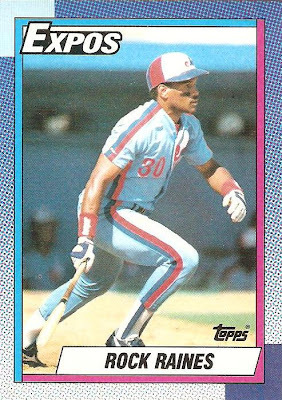 The orange border really works here, and I love how your eye is drawn to the similarity between the stripes on Wilson's shoulders and the multi-colored seats in the background. 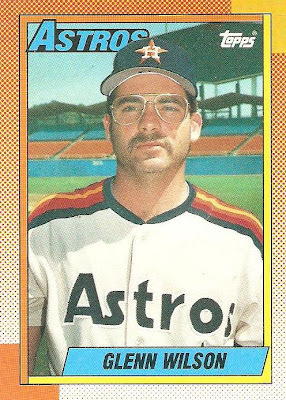 The glasses don't hurt either. 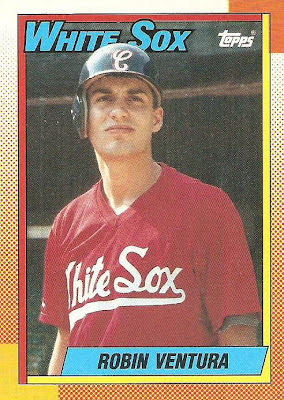 #121 - Robin Ventura - This is Ventura's second base Topps card, and the first featuring him in a White Sox uniform. I've always liked this one. #134 - Earl Cunningham - #1 Draft Pick - Not the type of Bruins card I usually feature on the blog. 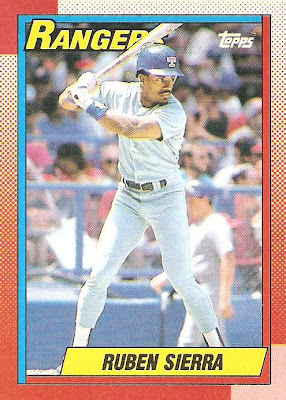 Earl is another player who gets a card in this set yet never had a single MLB at bat in his career. #142 - Jeff Wetherby - The border is ugly as sin here, but I just like the nice sunny day in the background. There's nothing better than baseball on a day like that. 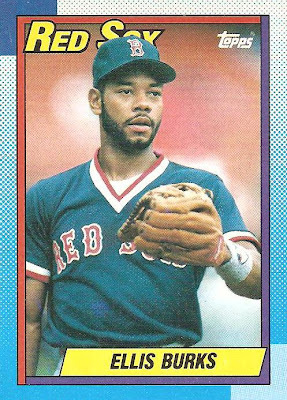 #155 - Ellis Burks - Burks' stolen base numbers dropped in 1990, it was the first time in 4 seasons with the Red Sox that he failed to steal 20. He had a great season offensively though. 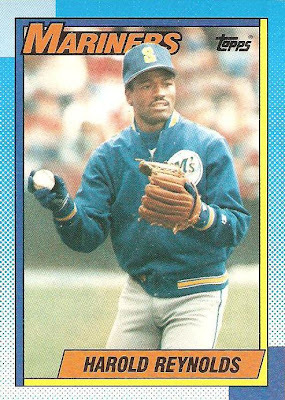 #161 - Harold Reynolds - Long before his "hugging" days at ESPN. 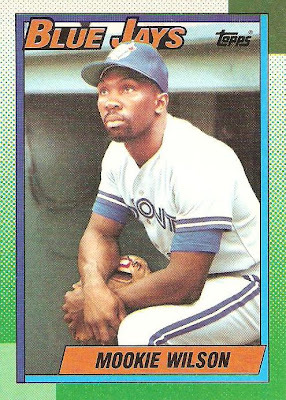 I actually really like Harold as part of a telecast, I used to watch him all the time on Baseball Tonight. 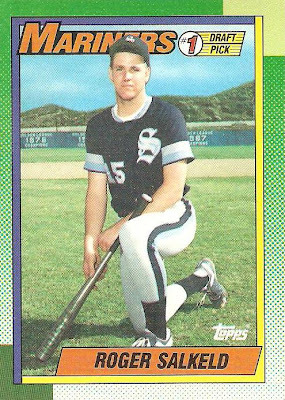 #162 - Todd Zeile - Future Star - As a kid I thought every player that had a Future Star card in the set was the next big thing. Todd did stick around for 15 years or so. 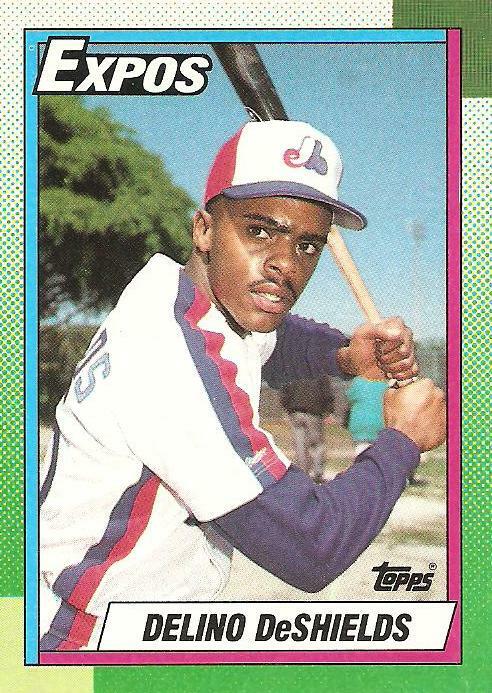 He hit a homer in his final at bat, which was also the last home run ever hit against the Montreal Expos. 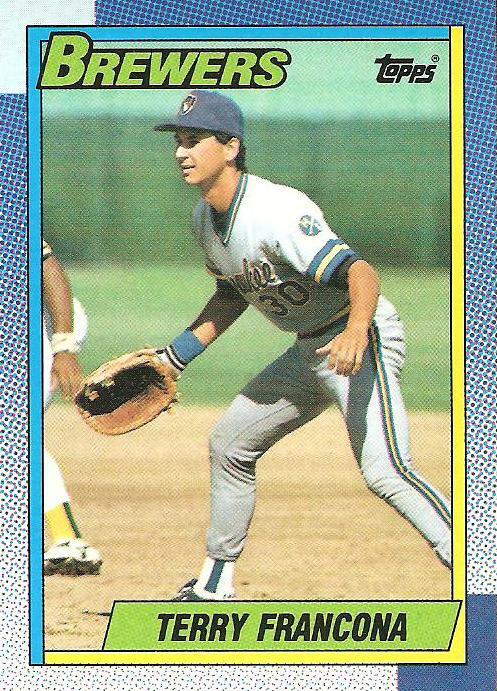 #164 - Jeff Juden - #1 Draft Pick - Alright, a #1 Draft Pick card of a player who actually enjoyed some MLB action! #180 - Tim "Rock" Raines - One of the greatest speed threats of his time. 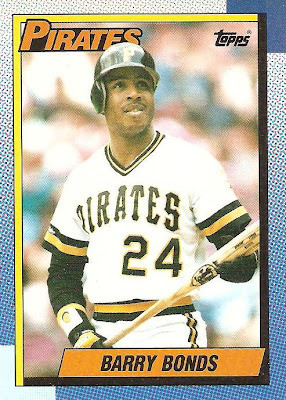 I think Rock saw some increased support for his induction to the Hall of Fame last year, but still came up significantly short. If you can believe Wikipedia then I think he got about a 30% vote. 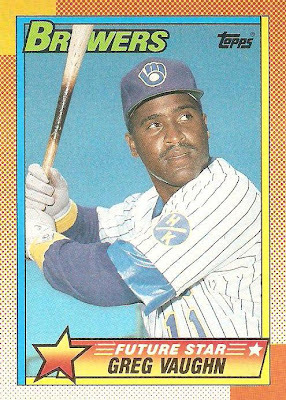 #185 - Ruben Sierra - Ruben had a pretty weak 1990 season, sandwiched in between great 1989 and 1991 campaigns. 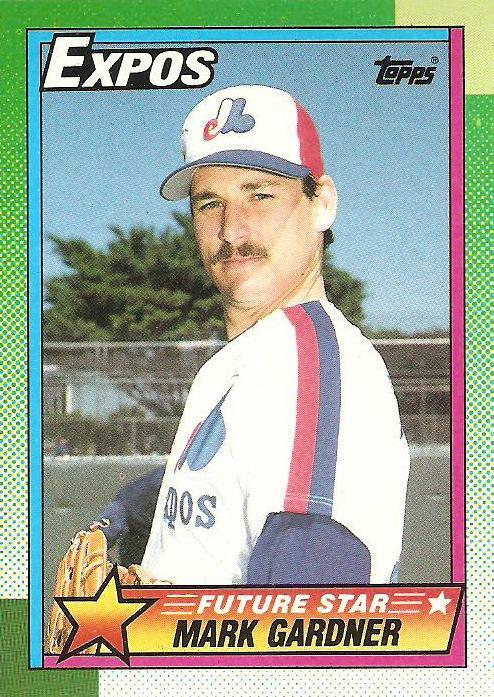 #195 - Tim Burke - I don't know what it is with Expos players and mullets in 1990, but like teammate Zane Smith in my first '90 Topps post, Tim is proudly sporting one here. Coming up later this week, cards 200 - 299. 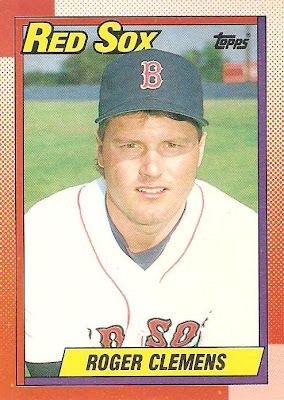 Quite a few more recognizable players to come in that batch. I think most collectors have a guilty pleasure. That set that most people find ugly as sin, but you just can't help but love. 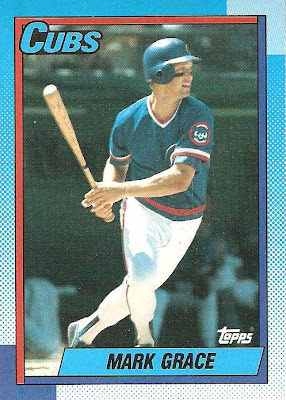 For me, that set is 1990 Topps baseball. 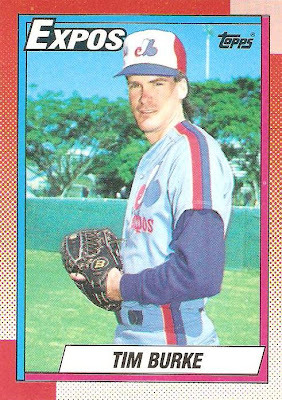 Generally regarded as one of Topps' worst designs, this 792 card monster has plenty of negative aspects. No name players you've never heard of? Check. Horrible multi-color distracting borders? Check. Healthy dose of grainy, low quality photography? Check. 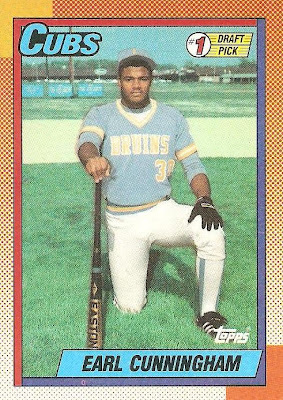 Nonetheless, this is the first real baseball set I ever collected in large amounts. 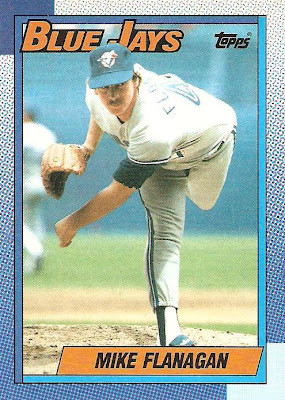 In fact, I think my brothers and I bought more of these cards than probably any other during my childhood collecting days. 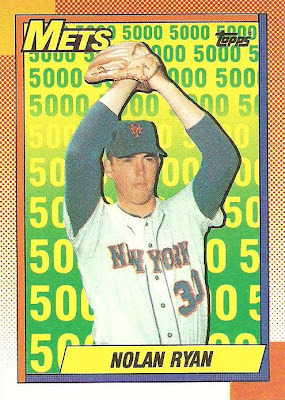 #2 - Nolan Ryan - Mets 5,000 K's Tribute - The next 4 cards were a tribute subset commemorating Ryan's achievement of 5,000 career strikeouts. 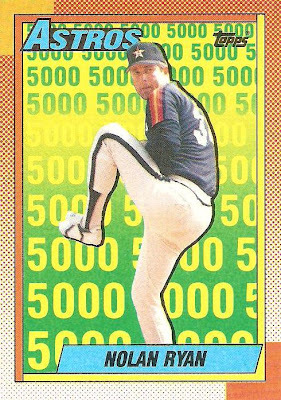 #3 - Nolan Ryan - Angels 5,000 K's Tribute - I'm sure sentimental value plays a large part in this, but I've always loved this subset. 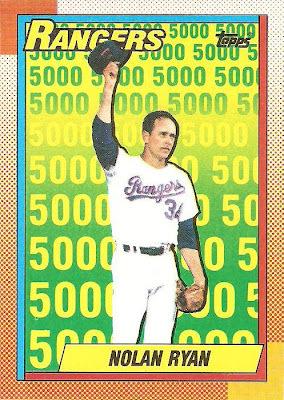 #5 - Nolan Ryan - Rangers 5,000 K's Tribute - I actually used to keep these in top loaders. Can you believe that? Hah! 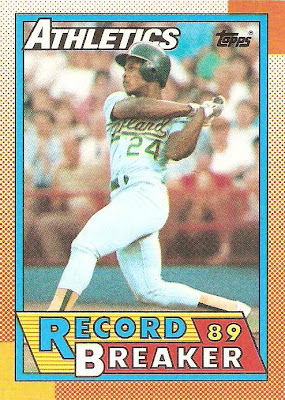 #7 - Rickey Henderson - Record Breaker - Cards 6, 7, and 8 were Record Breaker cards. 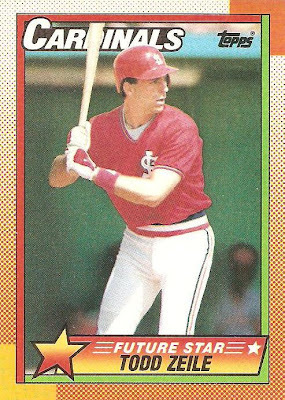 Henderson gets a card for belting 40 career leadoff homers, surpassing Bobby Bond who had the previous record with 35. 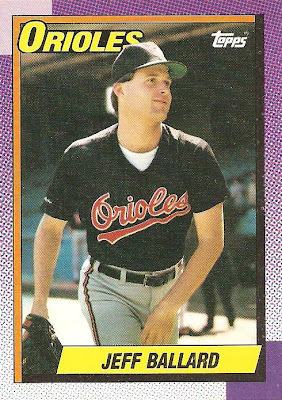 #8 - Cal Ripken Jr. - Record Breaker - Ripken gets a card for 8 straight 20-homer seasons, the most for a shortstop. 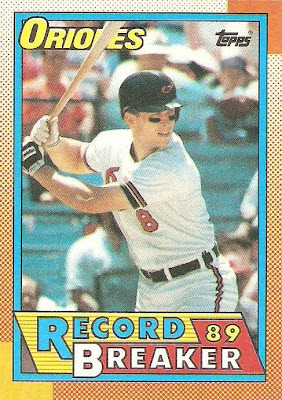 What shortstop had 7 straight 20-homer seasons and was surpassed by Ripken? None other than Ernie Banks. 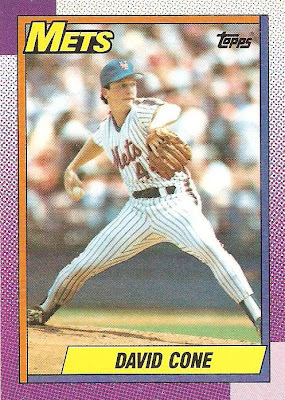 #30 - David Cone - I wanted to show this card because I think it's an example of how these crazy borders actually randomly get it right sometimes. 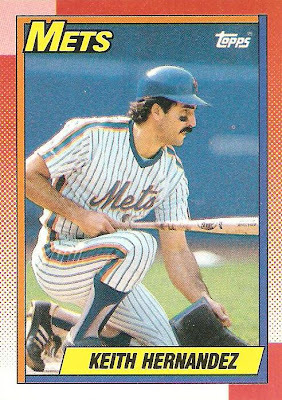 The purple outer border and solid orange inner boarder look great paired with a Mets jersey. 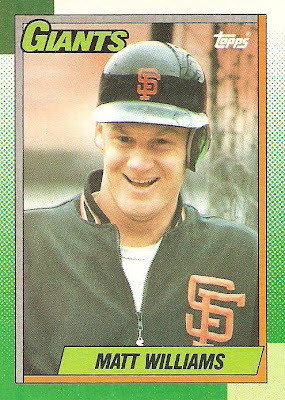 #41 - Matt Williams - This one has always been a favorite of mine. 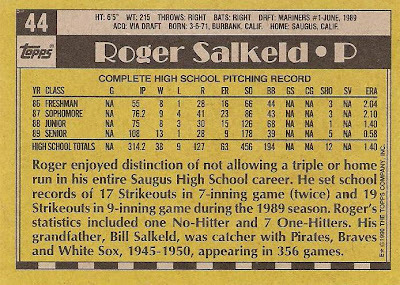 Another thing I love about 1990 Topps, full stats! 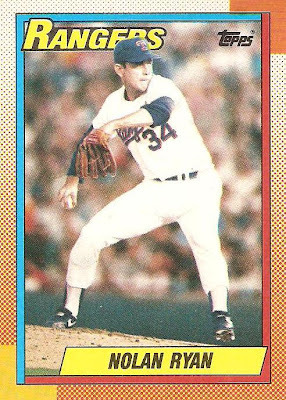 #48 - Zane Smith - This one was picked because it's an example of when the design doesn't work. 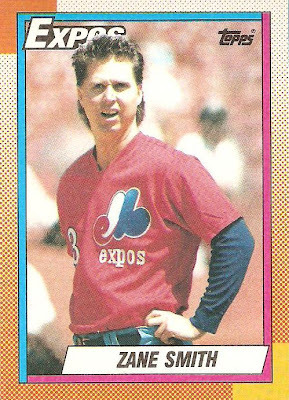 Plus, the mullet is great, the expression is great, and the Expos jersey is great. 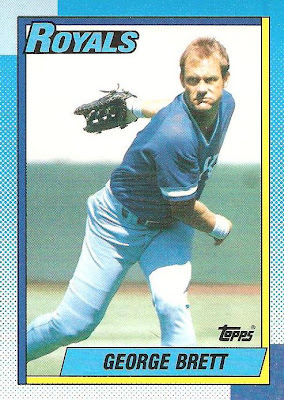 #60 - George Brett - Another card where the border actually works very well. 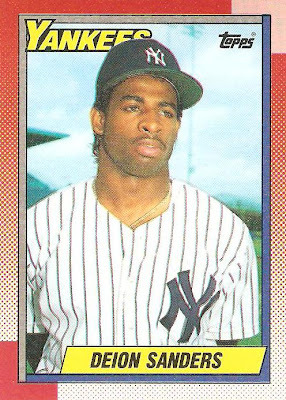 #61 - Deion Sanders - This card is classic. 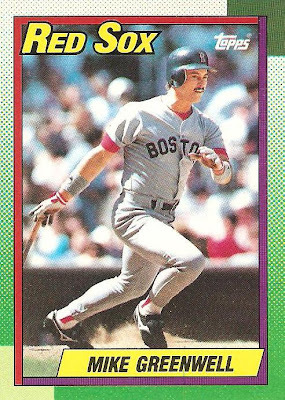 #70 - Mike Greenwell - Mike was one of my favorite Red Sox as a kid, largely because he had a great game the first time I ever attended in person at Fenway Park. #74 - Jeff Jackson - #1 Draft Pick - Jackson was the 4th overall pick in '89, right behind Roger Salkeld. He would never play a single Major League game. 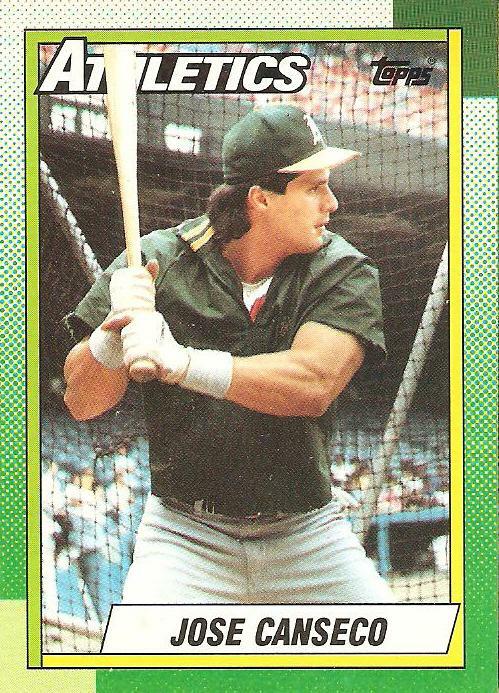 He does have a Topps card though! 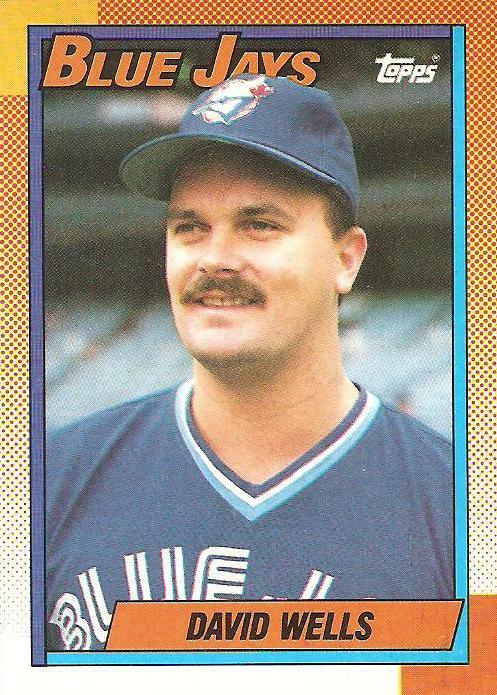 #78 - Mike Flanagan - Again, borders work here. 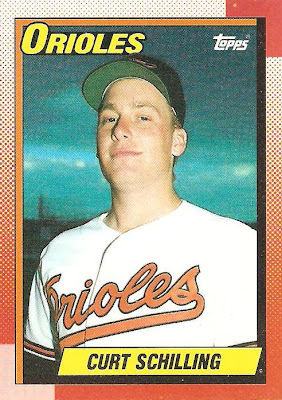 #97 - Curt Schilling - Before Curt had the "bloody sock incident", or the World Series Championships with Boston and Arizona, he was a pudgy young pitcher for the Orioles. I'm not sure if this would qualify as one of Night Owl's night cards. 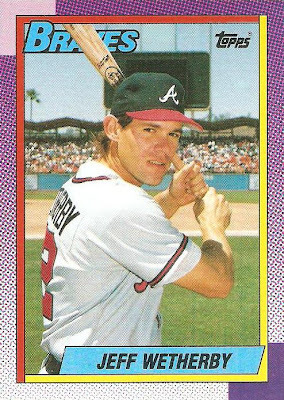 Well there you have it, my favorites from the first 99 cards of the 1990 Topps set. 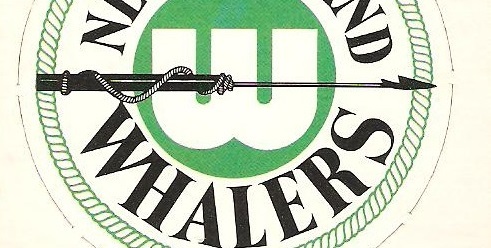 Post #2 coming soon!